for the month of october i was invited to present a new sound piece on the website of the palais de tokyo museum in paris. the piece is a reworking of a limited red vinyl 7" released in 2007, and made by manipulating the 1962 soundtrack LP of robert bresson's film proces de jeanne d'arc. the piece is titled "one stone. and arcs and ears." the piece was made by removing (although not completely and precisely) all of the speaking voices from the bresson LP, leaving only the background sounds, incidentals, etc. some of which were lightly processed. for the web version, i reworked some of the mixing on both tracks and cross faded them together to form one continuous work. since the original two tracks/sides were both made from side one of the original LP, it's nice to be able to share them as one continuous "ear film". i should also mention that it is really nice to click on a podcast-link and hear the opening sounds of crackling vinyl. 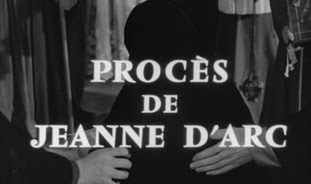 i began with the soundtrack LP of robert bresson's film "proces de jeanne d'arc", and edited out all of the talking of the main characters. in many cases my edits were not perfectly clean so whispered beginnings or endings of words can still be heard. i wanted the trajectory to lose its sense of narrative - to shake all of the specificity out of it. i wanted to turn it into a path of ambivalence, fragmentation, pauses, and abstraction. there is no music on bresson's original soundtrack, only talking and incidental sounds. on side one of the LP, a single musical instrument is heard for a few seconds (a horn playing a kind of fanfare in the middle of side one); and thus through sampling, i extended the horn sound, and used it to create a tonal field for the existing edited sounds to rest upon. i like very much how the crackling sounds of the original vinyl sometimes sounds a bit like the crackling of a very small fire.